Gone are those days when you’d have to carry a portable audio player for your need for music. 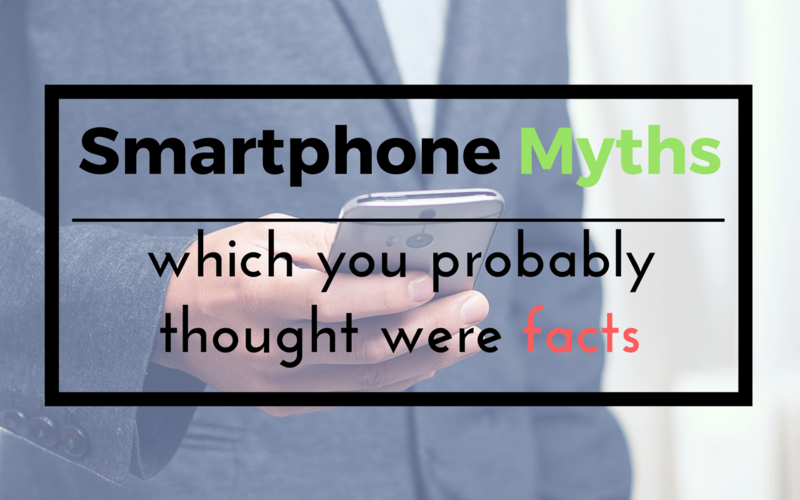 Today, most of us find our smartphones more handy for this purpose. Either we stream music or shuffle through our own library. 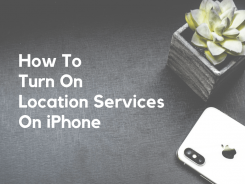 It is true that music streaming apps like Spotify, Deezer and Pandora are on the rise but still, there are many out there who carry a huge collection of songs in their mobile phones. 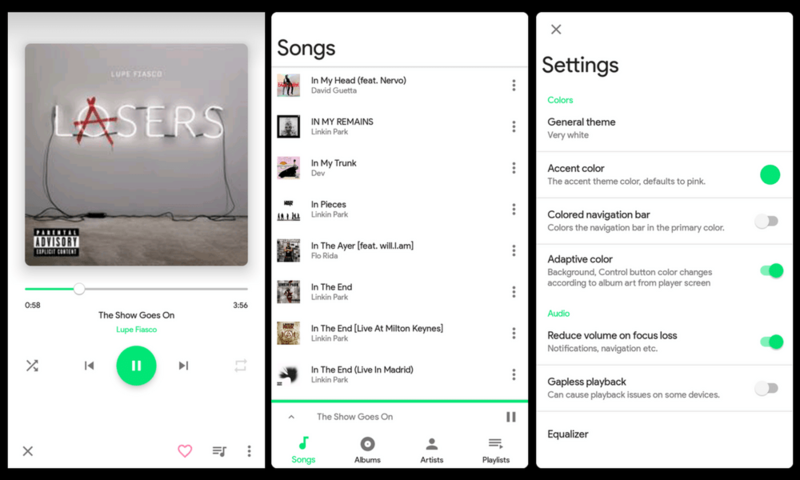 So if you are one of those who prefers his/her own collection of music rather than streaming, and are looking for a decent music player for your Android, then you are in for a treat as I list down the best music player apps for Android. 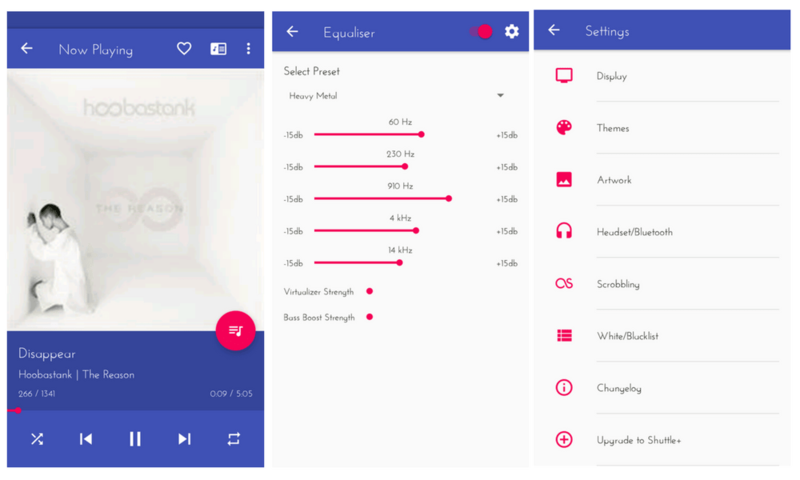 If you are looking for a music player with material design, then Phonograph Music Player is the right choice for you. It is lightweight, beautifully designed and has an uncluttered user interface which makes it easy to use and navigate. 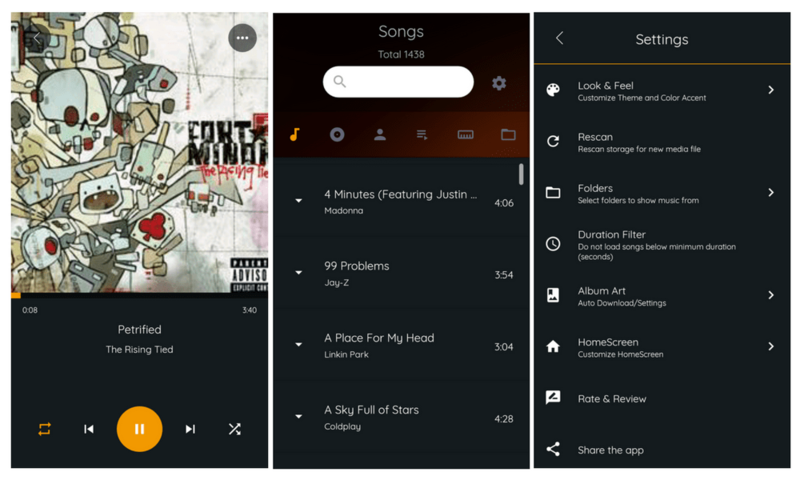 Phonograph Music Player offers three themes – Light, Dark and Black (AMOLED). 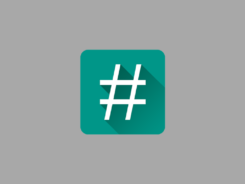 Along with three different set of themes, you can also change the primary and the accent color of the app. With the app you also get last.fm integration, homescreen widgets, a tag editor, sleep timer and lock screen playback controls. Phonograph Music Player is still in beta. But you won’t experience any kind of stability issues and the developer promises that new features will be added very soon. 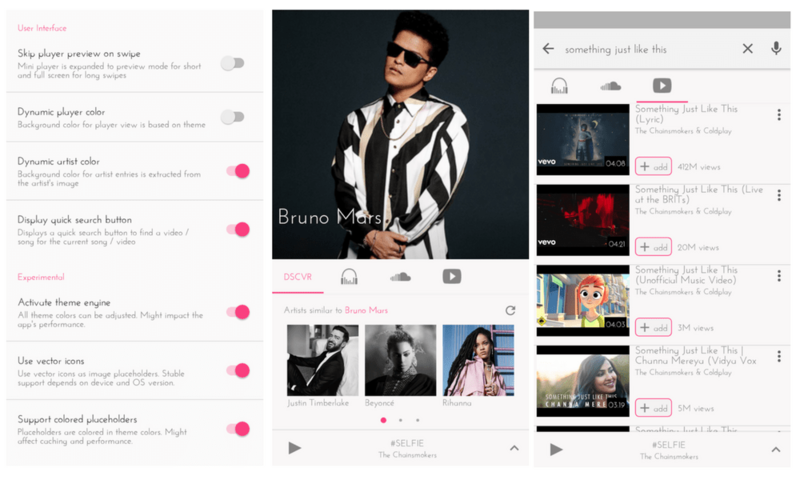 Stellio Music Player offers tons of features to play with. It supports almost all audio formats along with .m4b, .flac, .ogg and much more. The best thing about Stellio is that the player’s theme changes on the basis of album art cover of the last played song. Every time you change track, the player’s theme color changes. It sports 12-bands equalizer and 13 audio effects. It supports crossfade, gapless playback, sleep timer, offline lyrics, last.fm scrobbling and tag editing. Stellio lets you control music from your Android smartwatch as well. Stellio Music Player has five different set of themes. Flat and Material themes are free whereas for the other three you’ll have to spend some cash. Stellio is a free ad-supported music player app. You can get rid of ads by downloading the premium version. BlackPlayer Music Player is black and bold. 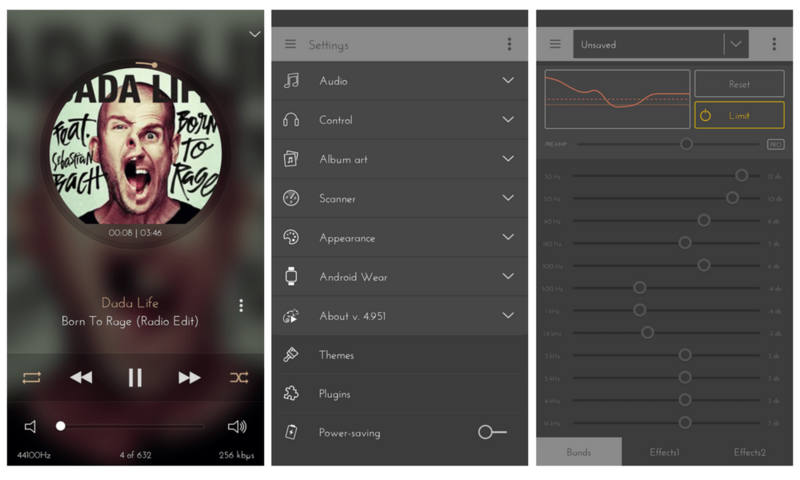 It is minimalistic in design and at the same time, it is a feature-rich music player. The app has an inbuilt equalizer, bass boost and virtualizer. As far as customization is concerned, you can customize pretty much everything. The app lets you change the accent color, fonts, animations and look & feel of the Now Playing screen. 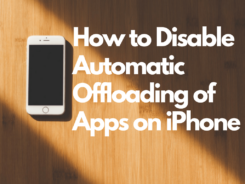 It supports all the common audio formats, crossfade, gapless playback, sleep timer, scrobbling, tag editing and home screen widgets. BlackPlayer Music Player is free (no ads) but also has a premium version, BlackPlayer EX, with more features, customizations and themes. 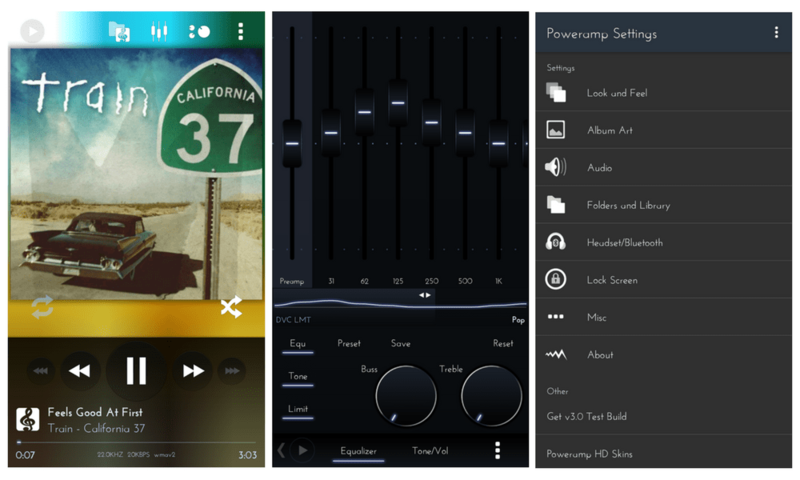 Poweramp Music Player is the most powerful music player for Android out there. Amazing user interface and a long list of features make it one of the best music player for android. It packs a 10 band optimized graphical equalizer and a separate bass and treble adjuster. On top of that, it also supports Stereo eXpansion and mono balancing. It plays all the popular audio formats, supports crossfade, gapless playback, replay gain, scrobbling, tag editing, lyrics and .cue files. The main USP of Poweramp Music Player is its customizable skins. You can choose from a good number of skins available in the Play Store to give a new look and feel to the player. No wonder why some people refer Poweramp as the best music player for Android. Poweramp Music Player is a paid app but you can try it for free as a trial for 15 days. Pulsar Music Player is tiny, easy-to-use and has everything that a basic music player should have. It offers gapless playback, Chromecast support, last.fm scrobbling, tag editing and various colorful themes. Pulsar Music Player lets you rearrange tab items in the main screen as per your liking. A very small thing but comes in very handy. It has all the other usual features like equalizer, sleep timer, home screen widget and bass boost. 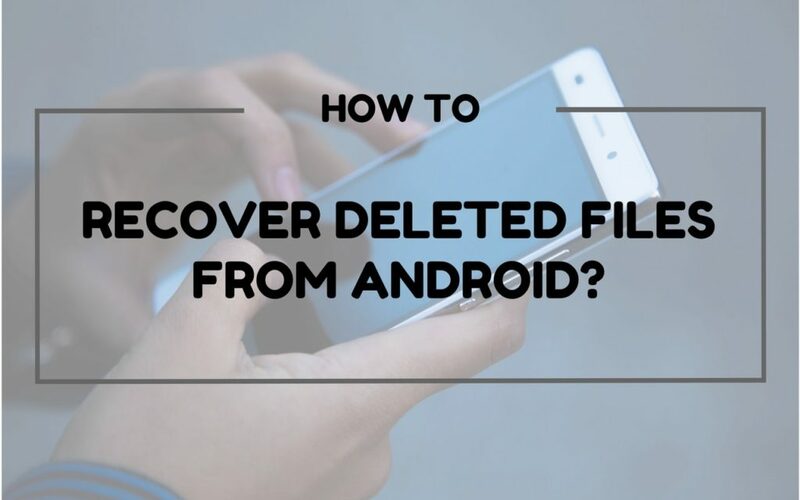 Pulsar plays all the standard audio formats like aac, flac, ogg, etc and it automatically downloads all the missing artist images and album artworks. Basic features together with an intuitive user interface make it worth downloading. The app is free with no ads and there is also a premium version called Pulsar Music Player Pro. n7 Music Player is different from all the music players out there. On the main page of the app, instead of displaying a list of all the songs, it displays artist’s name in a giant collage styled way. Zooming in on a particular artist will reveal the artist’s album artwork, tapping on which will take you to the album’s tracks. The developer calls it Artist Tag Surface. It has a 10-band equalizer, stereo balancing, bass & treble controller and auto volume normalization. Other features include gapless playback, crossfade, scrobbling and sleep timer. There are two separate apps (by the same developer) which integrate well with n7player. One is BLW Music Visualizer Wallpaper, which is basically a live wallpaper with a music visualizer. Another one is Toaster Cast, which lets you stream your music to external devices through ChromeCast and AirPlay. 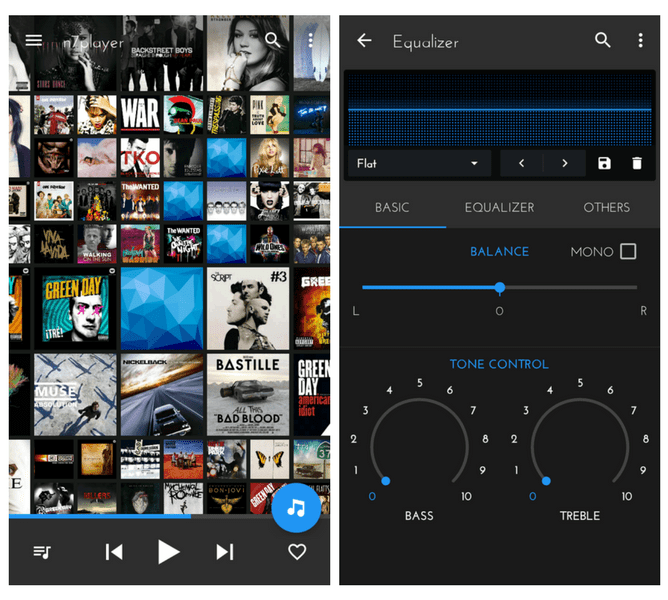 n7player is free for the first two weeks, after that, you’ll have to buy the app to keep on using its few set of features like equalizer, sound effects, themes and tag editor. Musixmatch is not just a music player. There’s more to it. First of all, it’s has one of the largest collection of song lyrics. Lyrics was, and still is, the main USP of this app but the app has grown itself to become a full-fledged music player. And that’s why Musixmatch is on this list. In terms of customization, musixmatch certainly lacks behind if compared with other players but there are some features (not found in others players) which make it worth your time. 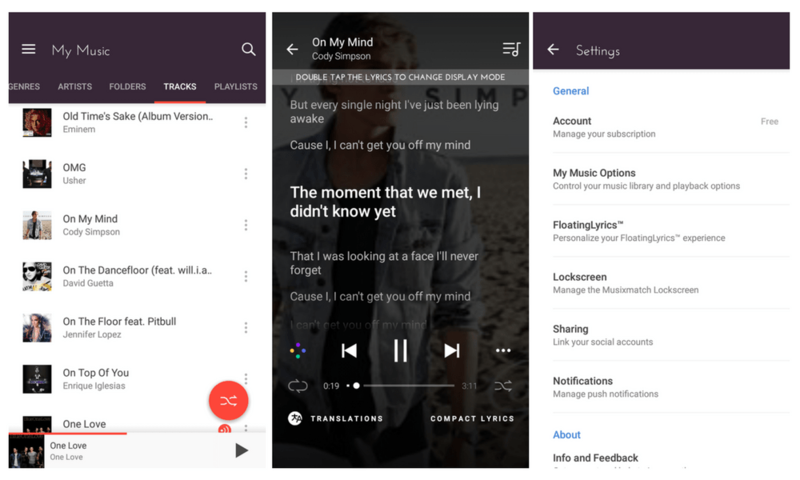 Some of the notable features of musixmatch are floatinglyrics, music identification, music translation, LyricsCard and more. The app notifies you whenever a new lyric of your favorite artist is available. Musixmatch is free ad-supported app. You can remove ads by purchasing the premium version of the app which will also unlock Offline Lyrics, which will save lyrics for offline use. Shuttle is an yet another music player with very neat and uncluttered user interface. This material design music player packs in 6-band equalizer along with some presets and bass boost. You can choose either of the three themes – Light, dark or black. It also lets you choose from a variety of theme colors and accent colors to suit your style. Other features include last.fm scrobbling, downloading missing album artwork, sleep timer, blacklisting and customizable widgets. Shuttle is for someone who is looking for a simple music player without any hotchpotch. 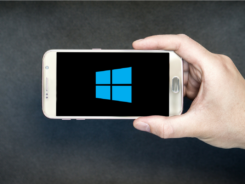 It is a free app but there is also a separate paid version of the app with extra features like tag editing and ChromeCast support. 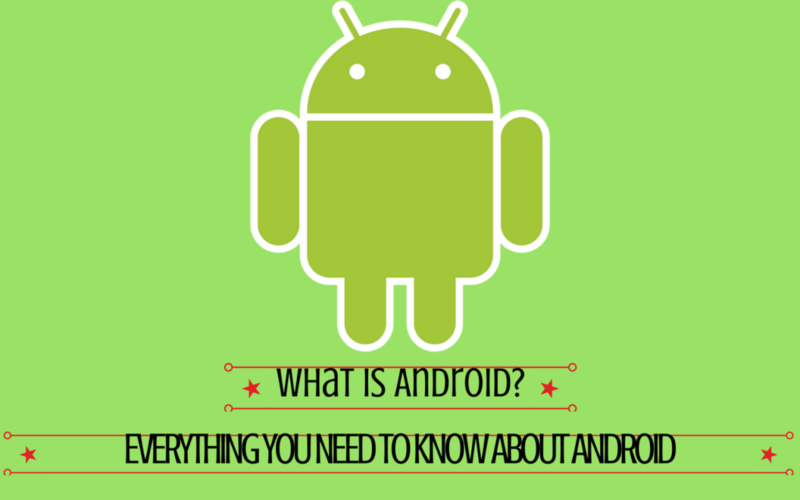 Autobeat has some really interesting features which makes it worth mentioning in this list. Starting off with the basics, it has a beautiful 5 band equalizer with 10 presets, lossless codec support and ChromeCast support. Autobeat gives you a good number of customization options. You can customize the background, text, accent color and icon color of every corner of the app. What really makes Autobeat stand out is it’s SoundCloud and YouTube integration. You can search for a song on SoundCloud or YoutTube directly from the app. You can even stream songs from SoundCloud and watch videos from YouTube within the app. Other unique features are artist discovery, trending videos and there is a switch button right at the bottom right of the album artwork. It switches from audio to video (from YouTube). Pi Music Player is one of the most highly rated music players for Android. 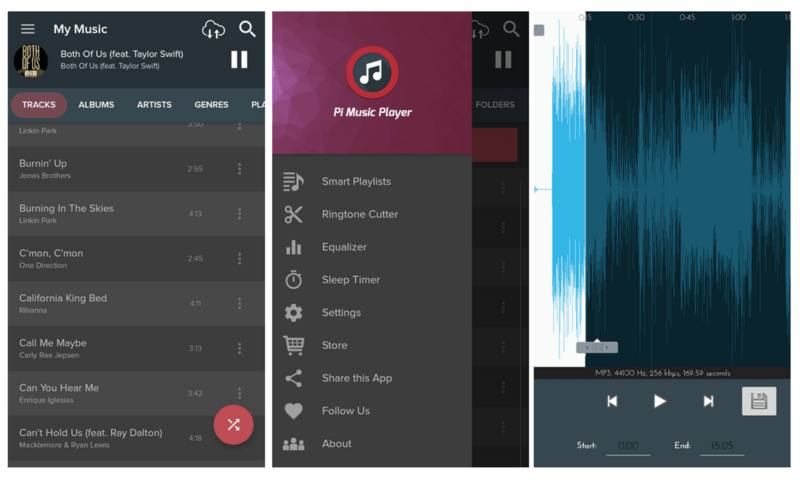 In terms of design, Pi Music Player gets full marks. Its material design and swift animations are eye candy. And not only the design, its user interface is intuitive too. It has an inbuilt ringtone cutter which does the job pretty well. Pi Music Player packs in 5-band equalizer with 10 presets, virtualizer, bass boost and 3D reverb effect. It offers 4 themes to choose from – Dark, Light, Gloss and Black Theme. You get various background packs to be applied on the Gloss theme through in-app purchases. Apart from this, there’s nothing more to customize. Other features are – sleep timer, widget support, Folder view and Pi Power Share, which is a cross-platform music sharing feature. Pi Music Player is a free (Ad supported) music player. There is also a premium version of the app, just in case you want to get rid of those ads. Musicolet is a fairly new entrant in the Google Play Store but has got some good reviews. Its user interface is simple and minimalistic. It has no separate window. Tracks, artists, genres and even the Now Playing screen is in one row. All you’ve got to do is – Swipe! It has a built-in 5 band equalizer with presets, surround sound and bass boost. 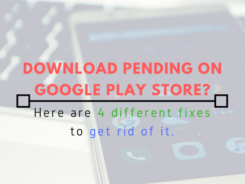 The developer claims that Musicolet is the only music player in the Play Store to support multiple play-queues. 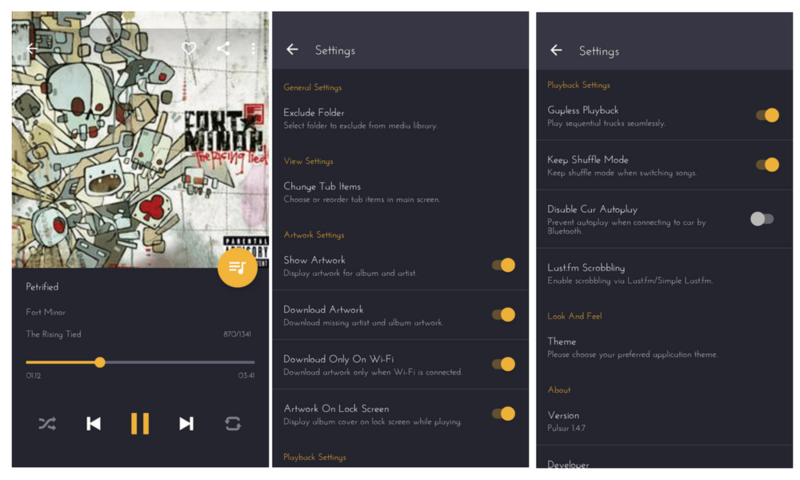 Musicolet Music Player has two different theme options – Light and Dark. Other features of the app are sleep timer, folder browsing, tag editor, embedded lyrics and homescreen widgets support. If you are an iOS fan, then you’d surely love Retro Music Player. 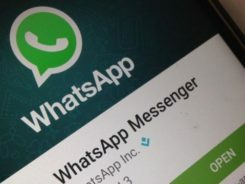 The developer behind the app says that it has a hybrid design. Material design + the feel of iOS. 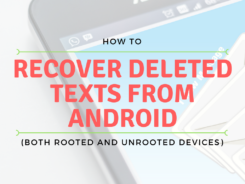 This combination of Android and iOS certainly hits the sweet spot as you’ll find the app’s design to very appealing. 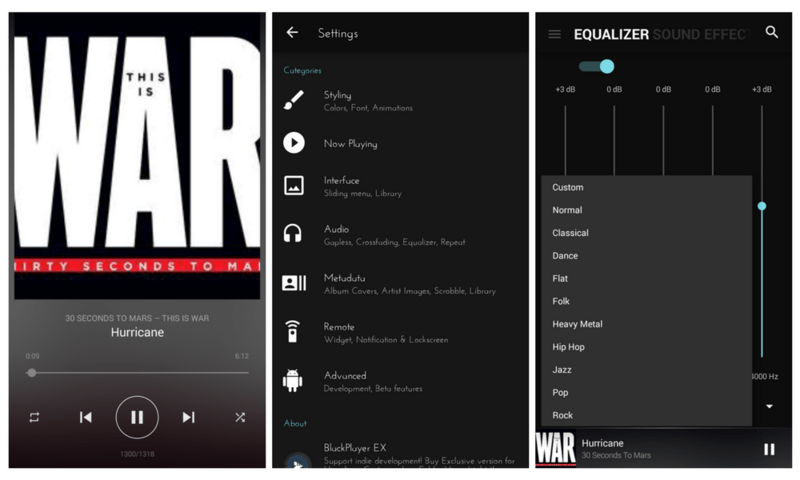 Retro Music Player has three themes – Very white, dark and Very black. Along with that, you can also change the accent color of the app. It supports gapless playback, sleep timer and 3 different sized homescreen widgets. 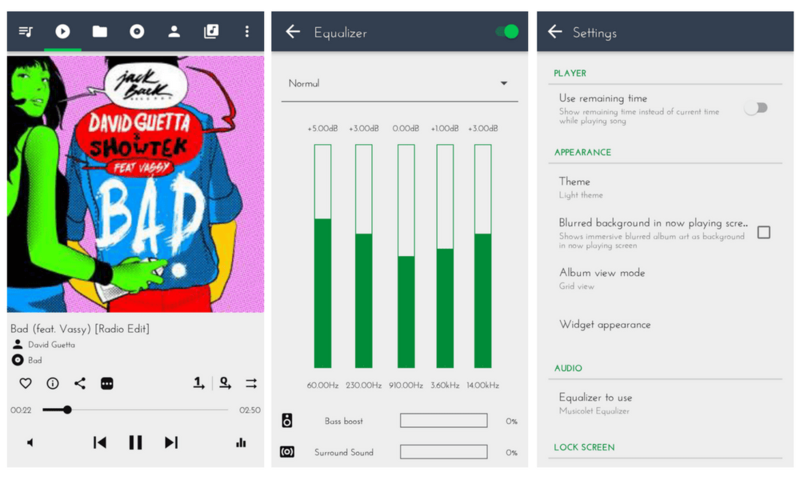 To be honest, Retro Music Player is not a powerhouse in terms of features and customizations but its intuitive user interface and minimalistic design have the ability to draw your attention towards this app. Retro Music Player is a free app which is still in beta stage. Last but not the least is Alpha Music Player. Alpha Music Player is one of the most beautiful looking music player out there. 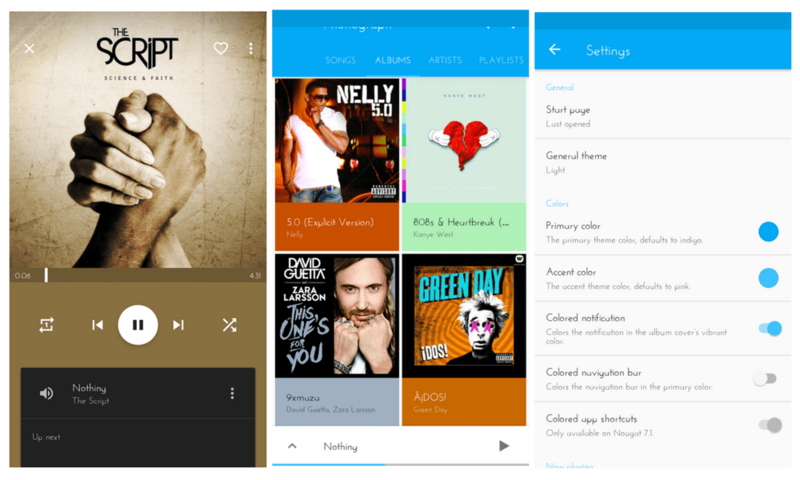 Gorgeous design and swift animations is what makes Alpha Music Player a must have. It has three different themes and a plenty of accent colors to choose from. And not only that, you can customize the player skin, fonts and animations. It also supports 5-band equalizer, bass boost and 3D effect. Alpha Music Player also lets you tag editing and download missing album art. Alpha Music Player is a free (Ad supported) music player which is worth trying. You can remove ads by buying the premium version of the app – Alpha Player Pro. 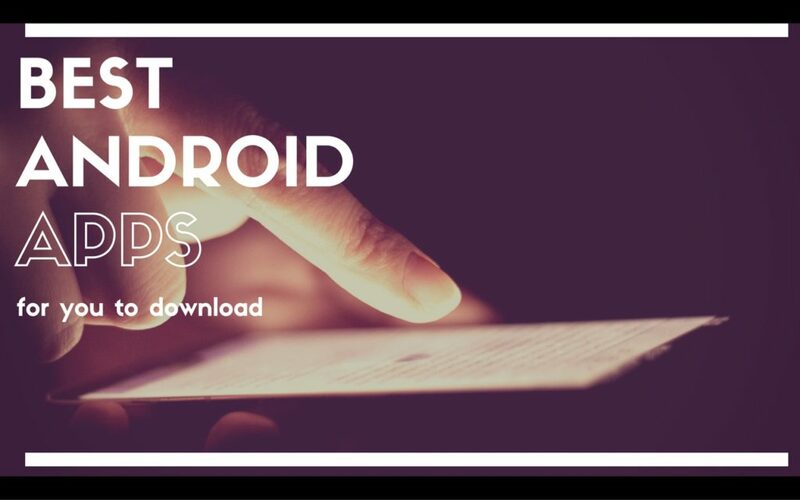 There are hundreds of music player apps for Android on the play store. And to list down the best is a tough call. One just can’t list down all of the best apps. Alright! These were 21, not 13, of the best music player for Android. Go ahead and download the one which suits your style and let me know what do you think. Do you think I missed out a great music player? Suggest me and I shall add it (after actually going through it) to this list. According to you which one is the best music player for Android? Let’s communicate in the comments section below! Don’t forget to share this list with your friends and family on your social network. Awesome list! I never knew there were so many to choose from. I like Phonograph music player. Easy to use! I’ve heard stellio is amazing! Sao you’ve got so many options! thanks for the detailed review of each one, super useful advice! 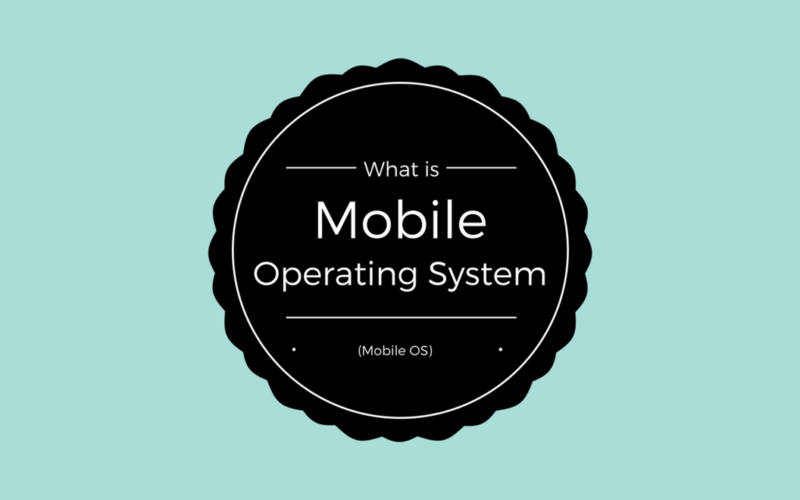 is there any application for IOS also. ?